Bass Pro Shops, online at BassPro.com, is a premier outdoor retailer. For the fisherman, Bass Pro Shops has an expansive collection of freshwater, fly, and saltwater fishing products. The selection at Bass Pro Shops doesn’t stop there -- find items for boating, camping, hunting, and archery, as well as clothing for men, women, and kids. Bass Pro Shops is an all-encompassing store for those who love the outdoors; find high quality outdoor gear and equipment at low prices. Check RetailSteal.com for Bass Pro Shops coupons, Bass Pro Shops discounts, and Bass Pro Shops promotions. Get $5 shipping on orders of $125 or more. Bass Pro Shops ships within the United States, Alaska, Hawaii, Puerto Rico, APO/FPO addresses, and most international destinations. Allow 3-6 business days for delivery in the US. Return items within 30 days of purchase for refund (see website for exclusions). Act now and get $10 FREE with Ship to Store from Bass Pro. Act now and enjoy free 2-day shipping on orders of $50+ when you shop today at Bass Pro Shops. 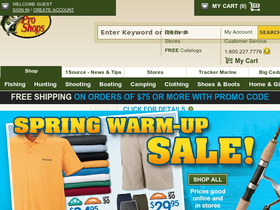 Check out Bass Pro Shops online for their latest special offers. Sign up today with Bass Pro Shops for $25 free! Shop now and find up to 75% savings in the outlet at BassProShops.com. Click link to shop for men's apparel from Bass Pro Shops, now up to 50% off.